The need to consume halal (permissible) food is significant to all Muslims. While halal is commonly associated with food, it has a far wider embrace with the potential to become a major global business brand. According to Dr Shahriar Kadir from the School of Business, a global halal market is unique - it requires additional expertise and specialised product capacity for that particular industry. “Halal export expansion requires additional production capacity, pressure on domestic resources and runs the risk of trade diversion,” stated Dr Shahriar. He shared a three directional trade flow model for understanding Malaysia’s trade performance in the global halal food market. 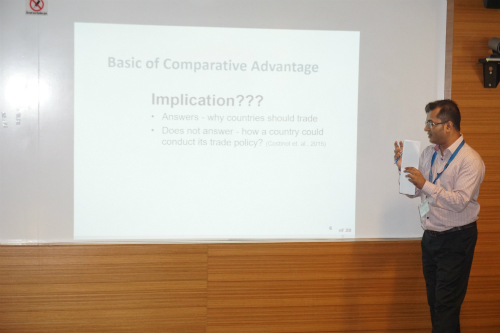 The results from Dr Shahriar’s study indicated that commodities with high comparative advantage are associated with the risk of long-run/short-run trade diversion from existing exports, which may not happen for commodities with relatively less comparative advantage. 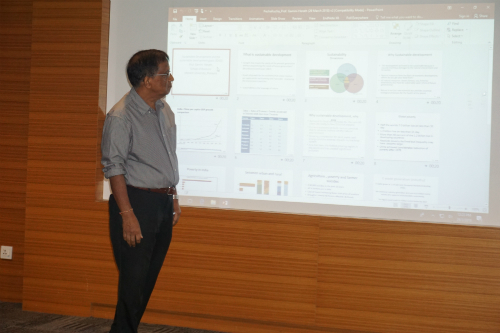 Stating that sustainability is the language of nature, Professor Gamini Herath said: “Sustainable development is a path of growth for the economy that raises income per capita while not harming and if possible, improving the environment overtime”. The School of Business professor also shared that the developments we have achieved are not sustainable because it has caused enormous damages to the natural environment and to society. Emphasising that all natural resources should be sustainably used, Professor Gamini said that the demand for food will increase for the next 40 years, and that current economic growth cannot continue due to adverse impacts on the natural environment. Touching on global poverty, he said that China has achieved considerable reduction of poverty after 1978. However, its rapid economic growth has turned it from a minor factor in climate change to a huge emitter of carbon dioxide. He also shared an alarming fact from his study - water in Malaysia contains arsenic exceeding World Health Organization (WHO) levels. Tests that were carried out in Langat and Klang rivers indicated high arsenic content levels.